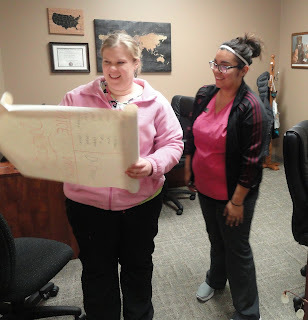 SIOUX CENTER – This is how it all started . . .
Dr. Del Lassen, the fun-loving and generous medical director and family practice physician at Promise Community Health Center in Sioux Center, sent out this all-staff email on Thursday, Nov. 11, with “Christmas giving” in the memo line. in response to his fun emails begging for gifts. And additional reminders, he did. Dr. Lassen – no stranger to giving himself as he supplies Promise’s staff with a large box full of assorted Casey’s Bakery donuts every Thursday morning – sent out cleverly crafted emails on weekly basis to staff. and Elizabeth Estefes, prepare "Santa's List"
for posting on Dr. Del Lassen's office door. named in the "Naughty" column. IN THE WORSE POSSIBLE WAAAYAA!!!! You won’t be able to get it out of your head . . .
Needless to say, the gift-giving to that point had been “underwhelming,” as Dr. Lassen had termed it in one of his emails. But he didn’t give up – resorting to every possible tactic. Even desperation, some might call it. I write to express my shame over previous memos. My self-centered, tasteless begging for gifts was beyond belief. I obviously need help. But --- help doesn’t come cheap these days. Let’s all do what we can to get me what I need!!! Cash donations to fund my therapy can be left anywhere I can find them. No amount is too large or unexpected. I need, I need, I need!!!! As the emails kept flowing out from Dr. Lassen to staff, the donations to the Tootsie Roll stash started rolling in. The collection of bags of Tootsie rolls and other goodies were hidden in a top-secret place where the needy doctor was sure to never, ever, find it. A Very Merry Christmas to all!! Watch out for the Grinch and those who put out tasteless memos. P.S. My birthday is in May, and I will be sending out reminders. Thirty minutes later, Dr. Lassen walked out the door for his noon lunch break. Promise’s Christmas elves scurried into action. They placed a Christmas tree adorned with candy bars, Monopoly money and Christmas cards – with a paper angel as the topper – on his desk. Bags of Tootsie Rolls and other goodies were strewn across his desk and on his chair. A scroll with “Santa’s List” was pasted to his door with two columns: Dr. Lassen was the lone name on the “Naughty” list on the right side. The names of the rest of Promise’s staff were neatly handwritten in the “Nice” column. Shortly before 1 p.m., Dr. Lassen walked into his office to his surprise. placed on Dr. Lassen's desk. Thanks to all for the wonderful Christmas surprise!! Please visit the Tootsie Roll bowl often and violently. The naughty/nice list was clever but highly inaccurate. Well, maybe the rest of the staff will beg to differ, but . . . Thank you, Dr. Lassen, for adding a lot of fun to the holiday season! And thank you for your generosity and humor throughout the year! From all of us at Promise, we wish all of you and your families a Merry Christmas. We hope it’s filled with love, joy and peace. And fun, too! 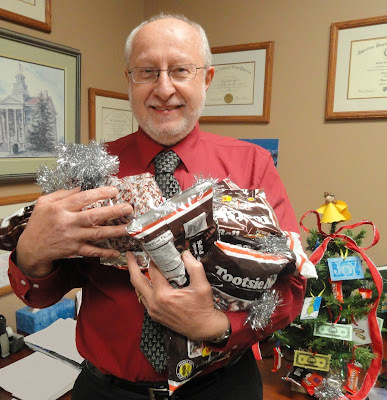 Check out the video of Dr. Del Lassen discovering his desk filled with bags of Tootsie Rolls: https://www.youtube.com/watch?v=1Z_TUGHCarI. Dr. Del Lassen not only is our fun-loving medical director, but he also knows a lot about family practice medicine. Effective in February, patients will have even more chances to see him for care as he will expand his hours from two days a week to three. 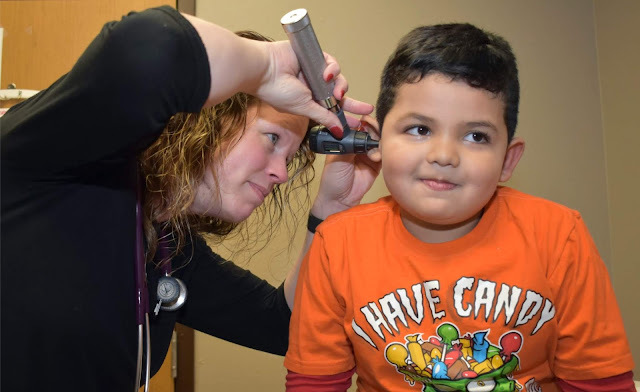 Dr. Lassen will continue to see patients on Wednesdays and Thursdays, but he also will add Monday or Friday to his weekly schedule depending on the week. Same-day appointments are available. Everyone is welcome at Promise! 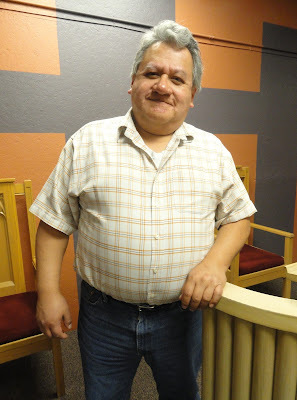 SIOUX CENTER – When Pastor Eddy Arturo Olguin moved to Sioux Center a year and a half ago, people in his church, Amistad Cristiana, told him many positive comments about Promise Community Health Center. So, his family started going to the health center for care. and is happy to serve in that capacity. Then, the invitation came for him to serve on Promise's Board of Directors earlier this year. Olguin, who is an immigrant from Peru, said serving on Promise’s board has been a learning experience for him. For one, he continues to work at mastering the English language, so it takes him longer to process and understand what is being said and to express his thoughts. Also, he is learning more about how a community health center operates and his responsibilities as a board member. But he’s settling into his role now. And he’s eager to learn more. Olguin thinks Promise plays an important role in the community. Pastor Eddy Arturo Olguin and his wife, Carmen, are from Peru. They have four children, Jair, 18; Valerie, 16; Alexa, 14; and Adriena, 10. Olguin became a pastor in Peru in 1995. He and his wife immigrated to New York City in 2001. He preached in various churches there before helping to plant a Christian Reformed Church serving Spanish-speaking people in Queens, NY, in 2003. In 2008, his family moved to DeMotte, IN, to help plant another CRC church serving Spanish-speaking people. 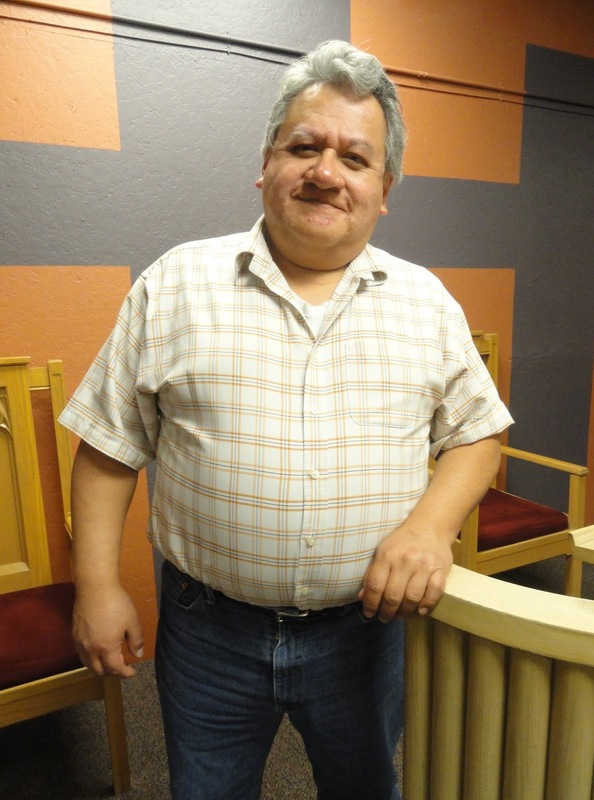 They moved to Sioux Center in June 2015 when Olguin became the pastor of Amistad Cristiana. In his free time, he enjoys watching movies. Health Center to give to families of newborn babies. and Lisa Dykstra and Michael Gallagher of Peoples. 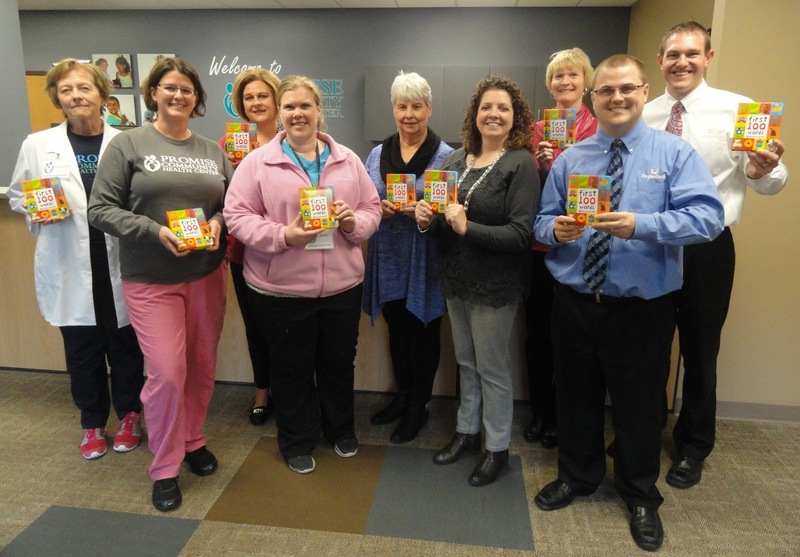 SIOUX CENTER – Every family that has a baby with the help of one of Promise Community Health Center's midwives will receive a book. 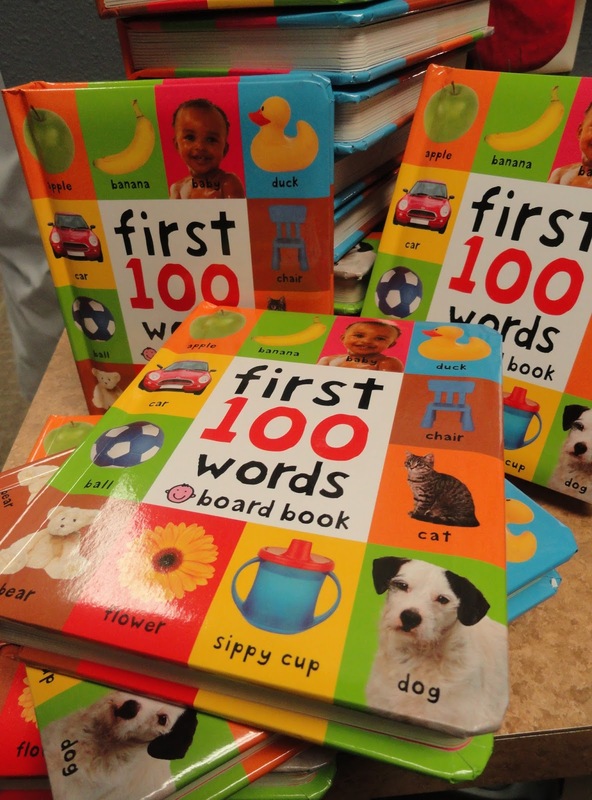 Peoples Bank of Sioux Center and Sioux Center Public Library partnered on a project to donate “First 100 Words” – a book of 100 pictures with descriptive words to go with them – to Promise and Sioux Center Health to give to families of newborn babies. Promise was supplied with 50 books to get the program started. “We want to ensure that any new child born in Sioux Center has a book because we know that not every family has that,” said David McAlpine, account specialist at Peoples Bank. 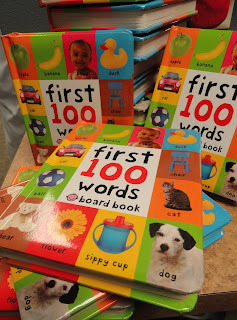 100 Words" books to Promise CHC. Library director Becky Bilby said Peoples Bank representatives approached the library with the book project idea and wondered if they could partner together on it. “We had always wanted to do something like this, but we don’t always have the funding to do it on our own,” she said. Belinda Lassen, certified nurse midwife for Promise, said the book will be a wonderful item to give to mothers and families who receive their care at Promise and will be well-received by them. McAlpine said the initial idea is to provide a supply of books to cover a year, but project will be reassessed and might become an ongoing endeavor. “That’s certainly the hope,” he said. SIOUX CENTER – Sioux Center Christian School fourth-graders are sharing God’s love to children at Promise Community Health Center in Sioux Center this Christmas season. 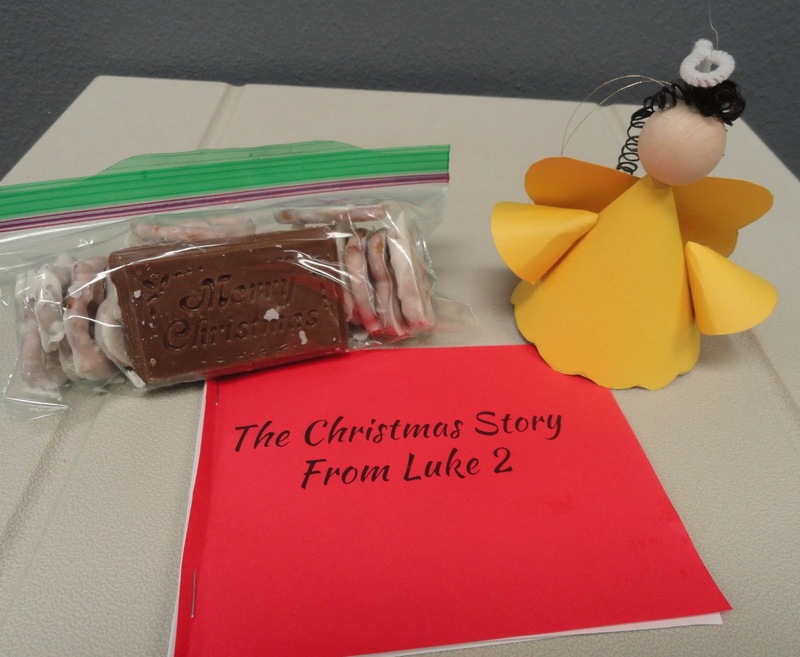 Every child who comes in for an appointment during December will receive a paper angel, a baggie of almond bark pretzels and a chocolate bar, and a small booklet with the Christmas story from Luke 2. All of the items were handmade by the students. Coke to Sioux Center Christian School fourth-graders. have appointments at Promise this Christmas season. The fourth-grade project was part of a school-wide challenge to provide service to others during the Christmas season. Laura Van Ravenswaay, one of the three fourth-grade teachers, said the 57 students in the class were excited to take part in the project. Van Ravenswaay said a donor provided each class with money to use for supplies for their projects. The fourth grade decided to make chocolate bars that say “Merry Christmas” in connection with reading “The Chocolate Touch.” In the book, the protagonist has a hard time seeing beyond his own interests until he is faced with a crisis when his mother begins to turn into chocolate after he kisses her. Center during this Christmas season. One fourth-grader used his keyboarding skills to type out the Christmas story from Luke 2 for the booklet. Last Thursday, the students rotated through three stations. In the first room, they prepared treats. In the second room, they made the paper angel ornaments. In the third room, they illustrated the Christmas story booklets. The fourth-graders delivered their handiwork to Promise on Monday. They took a tour of the health center and saw a brief demonstration from nurse Kristen Schuler about how much sugar is in a can of Coke and a bottle of orange juice. Van Ravenswaay was thankful the students had a chance to take the tour. “Even though they won’t meet the recipients of their gift, it helps them to visualize what the kids experience when they come to Promise,” she said. 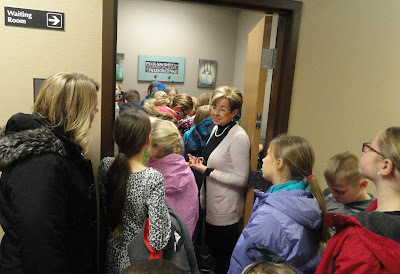 fourth-graders on a tour of the health center.